In the past I use the ApplePi-Baker as application to prepare an SD-Card for use with Raspberry Pi’s and to “Flash” and IMG file to an SD-Card. 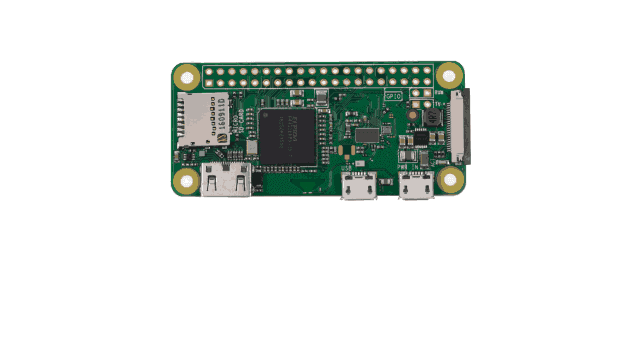 Now I found a new and more easy way to setup your Raspberry Pi Zero W. PiBakery, The easiest way to setup a Raspberry Pi. 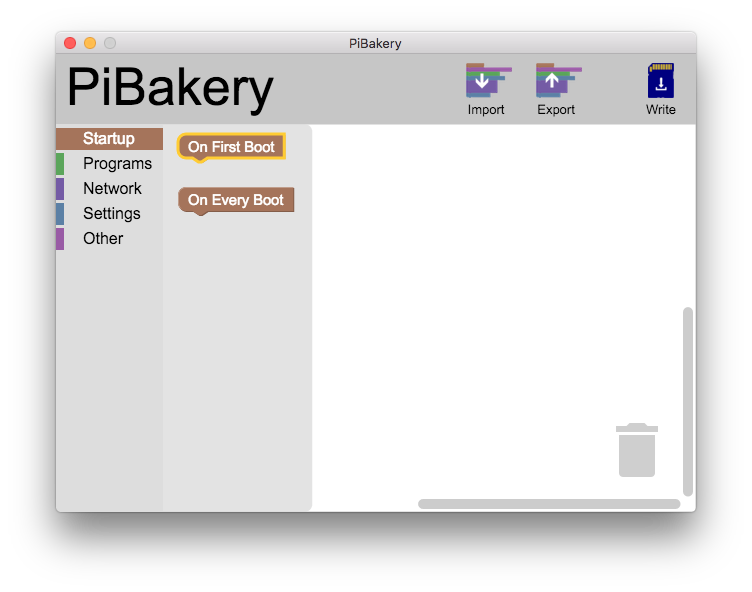 The first step to installing PiBakery on Mac is to download the installer. ( For a Windows installation go here.) Keep in mind that this download contains the full operating system for Raspberry Pi, and is therefore a large file, which can take a while to download depending on the speed of your internet connection. 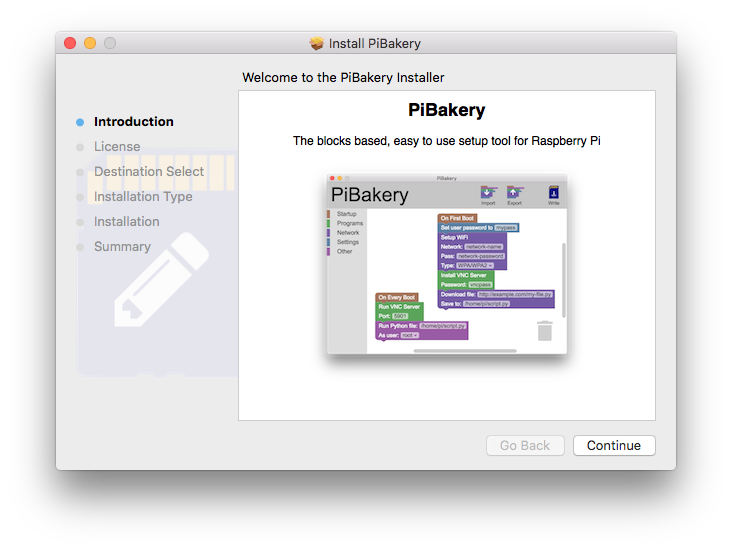 Once the PiBakery installer has finished downloading, you need to install it. 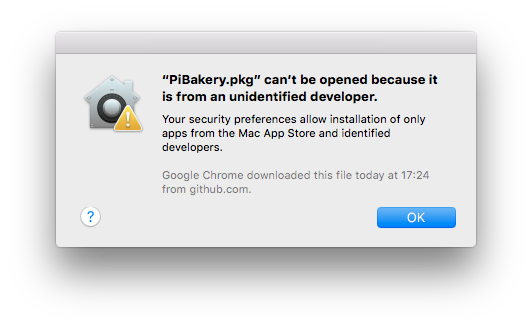 However, if you simply double click the PiBakery.pkg file, you’ll be presented with a window telling you that “PiBakery.pkg” can’t be opened because it is from an unidentified developer. To get round this security precution, all you need to do is right-click on PiBakery.pkg and then click Open. 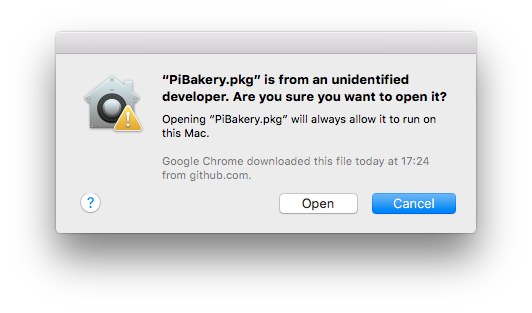 You’ll still be presented with a warning telling you PiBakery is from an unidentified developer, but this time you’ll be given the option to open it anyway. In the window that comes up, choose Open. Once you’ve opened the PiBakery installer, you’ll need to click through the different screens, accepting the license agreement, and typing in your administrator password. 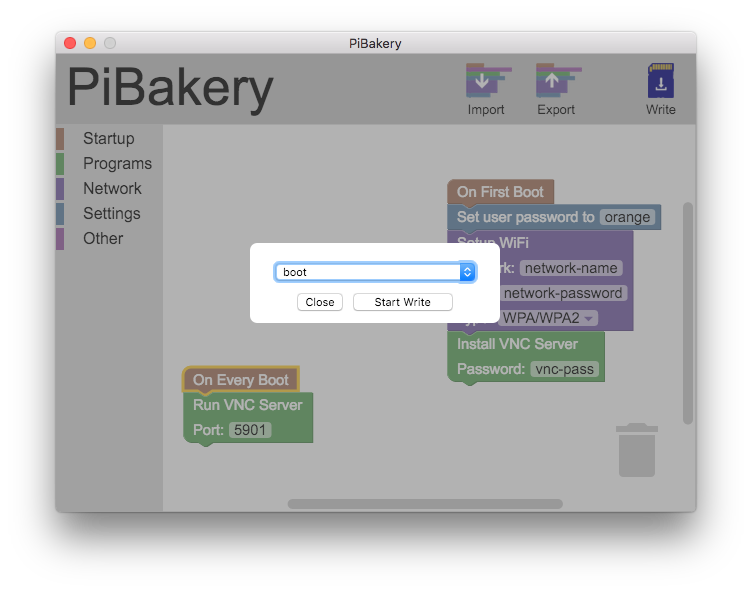 PiBakery will then install on your Mac. This usually takes under two minutes to complete, at which point the installer will tell you that everything was installed successfully. You can then close the installer. 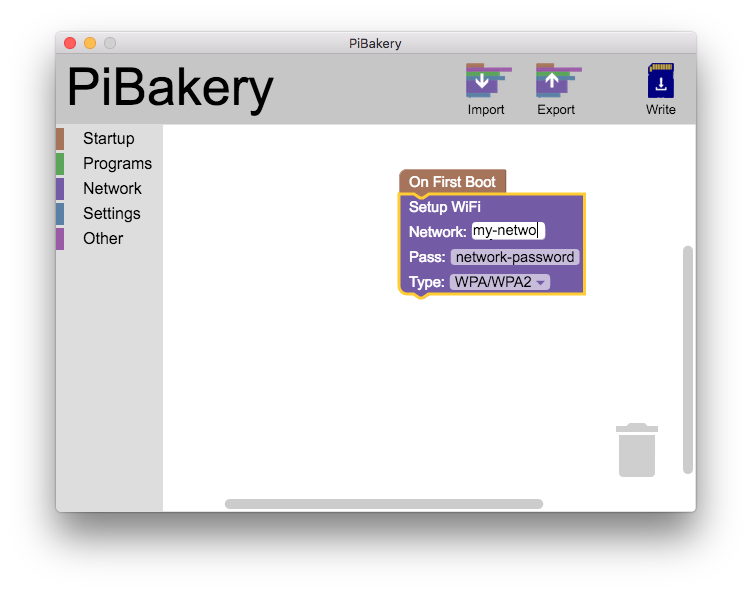 Now that you’ve installed PiBakery, you can start using it. 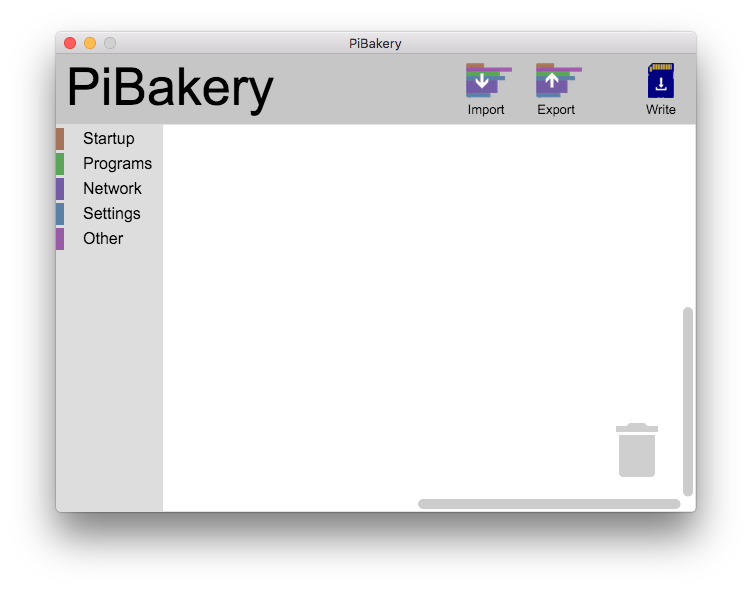 In your Applications folder, you’ll see a new app, PiBakery. To open it, double click it as normal. The first time that PiBakery is run there is a small possibility that it may tell you that there is an update available. This update is optional and if you choose not to update, you’ll be asked again the next PiBakery starts. And that’s it! PiBakery is ready for you to use! If you haven’t already, open PiBakery and insert your SD card. If you’ve used that SD card with PiBakery previously you might see a message asking if you want to update the SD card. In this case choose No, as we want to create a fresh install, rather than editing a new one. You should now see a window which looks like the image to the right, which means your ready to start creating your own customized version of Raspbian. On the left of the PiBakery window is a column with the different categories of blocks. Clicking on any of these will show a toolbox with all the blocks in that category. First of all you’ll want to tell PiBakery when you want your customizations to happen. Click on the Startup category, and you’ll see two blocks; On First Boot and On Every Boot. The On First Boot block is the one that you probably want, as it allows you to customize Raspbian as soon as your Raspberry Pi boots up for the first time. Click and hold on the On First Boot block, drag it onto the main workspace, and release. 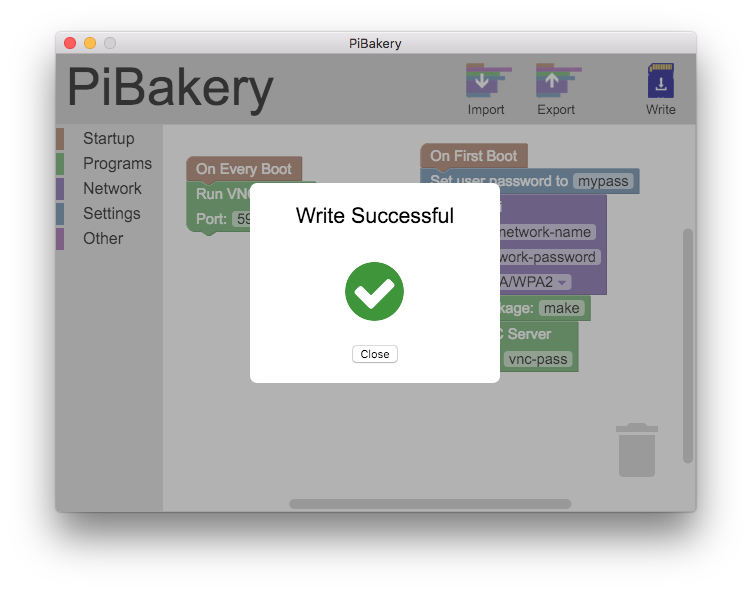 Now you need to tell PiBakery what you want to happen on first boot of your Raspberry Pi. This is done by dragging out blocks from the other categories and releasing them underneath the On First Boot block so that they snap together. The blocks will run from top to bottom, so a block that is higher up will run before a block below it. An example of a block that you could drag out is the Setup WiFi block. This block will store a WiFi network’s details on your Raspberry Pi so that whenever it is range of that network, it will connect. You can see the Setup WiFi block connected to the On First Boot block in the image to the right. Continue adding blocks under the On First Boot block. For example, under the Programs section you could to install a web server with the Install Apache/PHP/MySQL block (internet connection required), or you could use the Set user password to __ block in the Settings section to change the default password on your Raspberry Pi. You can also define what your Raspberry Pi does on startup, using the On Every Boot block. Blocks that are placed under this block rull run every single time that your Raspberry Pi is started up. This is useful for auto-starting Python scripts, or other programs that you have made. An example of a block that you could place under the On Every Boot block is the Run VNC server block. A VNC server is a way of logging into your Pi and controlling it without a keyboard or mouse. This block will see if you have a VNC installed, if not install one, and then run it on your chosen port. Whilst choosing what blocks to use, be aware that some of them require an internet connection to work. To find out whether a block needs an internet connection, hover over it, and a small description will appear which will tell you if it needs an internet connection. Once you’ve created the perfect setup for your Raspberry Pi, you’re ready to write it to an SD card to use. Insert an SD card into your computer and click on the Write button in the top right corner of PiBakery. This will bring up the SD card chooser, as shown in the image to the right. Choose your SD card from the drop down menu making sure that you choose the right one. The drive that you choose will be erased and then written over, meaning that any data on it currently will be deleted permanently. Once you’ve chosen your SD card, click on Start Write and choose Yes in the warning dialog that pops up. PiBakery will then start to write to the SD card. This will take a few minutes, depending on the speed of your computer and the speed of your SD card. Once the write has finished, you’ll see a green tick with the Write Successful message. Once PiBakery has finished writing to your SD card, you can remove it from your computer, insert it into your Raspberry Pi and power it on. Your scripts will be running after a few seconds, customizing Raspbian to your requirements. Depending on which blocks you specified, the scripts can take a while to run. This is especially true for installing programs, which can take around 5 minutes to complete. And that’s it. Your own customized version of Raspbian.